One of the biggest enemies of an average teenager is boredom. When Spring Break came along, I thought I would be happy to receive a one-week break from school. Instead, I found that I was restless of not having any activity. 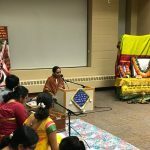 So when my mother signed me up for Sampradaya Camp, a three-day session to enrich local teenagers with Hindu cultures and traditions, I was eager to see what I would learn. I left the three days with an experience I will never forget for the rest of my life. Of course, the biggest challenge of Spring Break was to wake up by 7 AM to get ready for the camp. I dressed up, ate my routine cereal breakfast, and set off to the ISKCON Temple where the activities were being held. From the moment I arrived there I knew I was going to enjoy my next three days. Twelve other teenagers in my age group gradually began arriving one-by-one. I was glad to meet an adult I had known for a long time, Mrs. Priya Murali, who had created the camp and overlooked the activities. Once everyone had arrived, things got settled down and the day started. We kicked the camp off with a refreshing session of yoga, taught by Piyusha Pandya. The great asanas and techniques taught did wonders to help us get hyped up. Immediately following the session was an introduction to movie-making! I was so impressed that the camp had the exact activities that appealed to kids of our age. After a review of the art of making movies from Kevin Strehle, a professional cameraman, we got to the hands-on activity mentored by none other than Vijay Sureshkumar, assistant director of the movie Raavan! At this point, the thirteen of us were so engrossed on the activity that we didn’t notice the hours fly by. We couldn’t wait to start scripting our movies that we were going to film the next day. We divided up into two groups and came up with great ideas that we worked to turn into a short film. With the exciting thought that we were shooting the next day, we set off to the nearby school for an exciting session of cricket! In light of the recent India victory of the Cricket World Cup, we played with intense enthusiasm and had great fun. The next day was just as fun as the first. We began with our anticipated shooting session where we acted out our two scripts. It took all morning but we had fun every minute of it. When we next looked at our watches, it was lunchtime already! Following lunch, the girls had an exclusive mehandi session and decorated their hands with beautiful designs while the boys were given an overview of the musical elements of India from the professional tabla player Chaz Hastings. We even learned how to make aloo paratha—the best part was eating them afterwards! Then we got to one of our favorite parts of the day, another cricket session. This time we were more competitive as a result of the previous day’s game, and had great fun hitting sixers and getting people out. We went home that day with a bittersweet feeling that the next day would be the last at our beloved camp. We ended the camp with a blast. 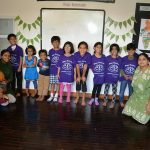 Our friends and family came along to watch as we modeled in our traditional Indian garb, proudly screened our fantastic movies, and showcased our debating abilities by discussing the importance of sampradaya activities. As we all bid each other goodbye, I realized that I would miss all the great friends that I had made in a mere three days. However, I knew that I was leaving with a plethora of knowledge I would have never learned otherwise. It is stressed that growing up here in America, it is important to keep in touch with our Hindu cultures and traditions….In the past three days, I had cooked parathas, hit sixers, participated in a fashion show, and filmed movies, all while learning about the great and unique culture that makes India so unique. 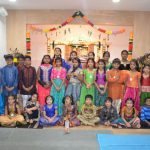 When I sit here a week later and think of what to write, I consider this not a “report” but rather a way to share my great experiences with others about my days in Sampradaya Camp.